Only for Coupe, will not fit convertible models. This Stealthbox® is designed for serious sub-bass performance and minimal loss of useful trunk space. It features a potent 12W6v3 premium JL Audio subwoofer driver in a 100% fiberglass sealed enclosure that tucks into the driver side rear corner of the trunk, while retaining full access to the battery compartment under the trunk floor. 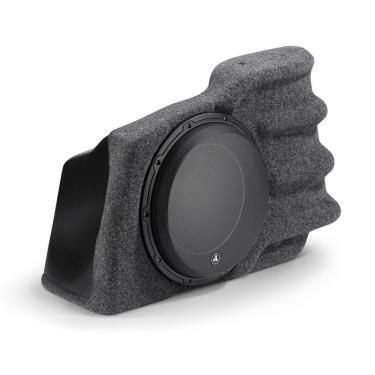 If you're looking to retain the rear seat pass-through functionality while rocking your Camaro with top-flight sub-bass, this is your subwoofer solution. The Hard Data: Contains one 12W6v3-D4 in a sealed enclosure. 600 watt power handling. Wired for 2 ohm mono. Installs in driver side of trunk. Black steel mesh grille included. Will not fit convertible models.